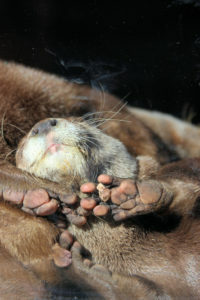 Animal World & Snake Farm Zoo’s featured animal for March is the Asian Small Clawed Otter. 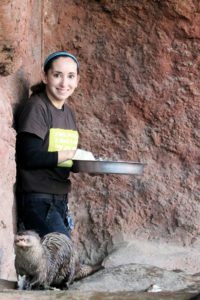 We sat down with Mammal Keeper, Paulina Cantu, to talk about these adorable creatures, and answer some questions submitted by our Facebook and Instagram followers. Before we get started talking about Otters, tell our readers a little bit about you. 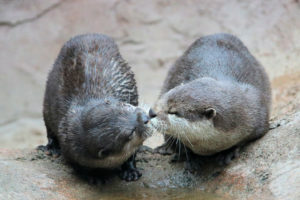 I am a primate and bird nerd, but otters have stolen my heart. I am originally from Spain and I have worked with primates for three years and birds for three years. Working at Animal World & Snake Farm Zoo has been great because I’ve gotten to expand my knowledge of different species. The story of how I became a zookeeper is a little different from most zookeepers. I have a Masters degree in Journalism, French and Media. I was writing for politicians and I hated it! Then, other unexpected events happened in my life, so I decided it was time for a change. I began interning at zoos and vet clinics. It has been six years and I have not looked back. I love having a career where I feel like I have a positive impact on the world. Can you tell us a little bit about what daily care of our otters looks like? I hope you like squeegeeing because you do that a lot with otters and I hope you like squeaking noises because you hear that all day! But, it begins with shifting the otters into their “bedroom.” Once they are shifted and secured, we go into their exhibit and clean it. We then add toys and enrichment! After that, we have to clean the glass. They LOVE attention, are highly intelligent, and find the guests very stimulating. Because of that, they constantly have their little paws against the glass. Kids and adults love looking at them too, so they will also put their hands against the glass. This means we have to clean the glass multiple times per day. Once all of that is done we shift them back into their exhibit and the guests can see them swim and interact with the rocks or their enrichment. 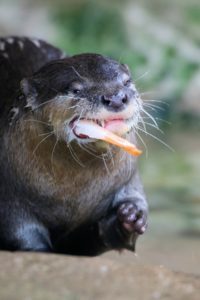 Some of our Facebook followers want to know what Asian Small Clawed Otters eat. They eat better than I do! Their metabolic rate is really fast, so they get fed twice a day. They are constantly hungry. They get otter kibble, which is filled with all of the vitamins and nutrients otters need. They also eat shellfish and seafood, anything from halibut to capelin to crab. They get a wide variety. Their favorite foods are salmon and tuna! They are so fun to watch because Asian Small Clawed Otters are the only otters that eat with their hands as opposed to going in face first. 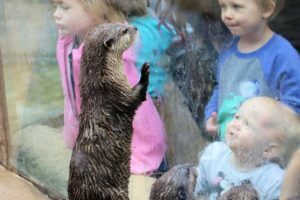 I definitely recommend planning your next visit around our Otterly Awesome show, so you can watch these adorable little critters eat with their tiny hands in person! It’s definitely one of my favorite interactive shows that we do, but I’m probably a little biased. Why do Otters make the little squeak noises? They have upwards of 12 different types of vocalizations. The ones that we hear most often are the “feed me!” squeals. That is the constant squeaking they are doing, even though they get fed twice a day. 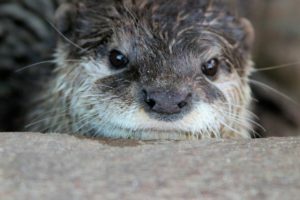 What is the lifespan of an Asian Small Clawed otter? The typical lifespan of these animals is anywhere between 12 and 20 years! That is Papa Otters favorite thing! Otters love rocks, they love rolling in them, playing in them, going to the restroom in them, taking them to their nest, etc. When we peek in on them in the morning, we even see the pebbles arranged differently! So, I know that when we are gone they are constantly playing with them. They also like attention from the guests. 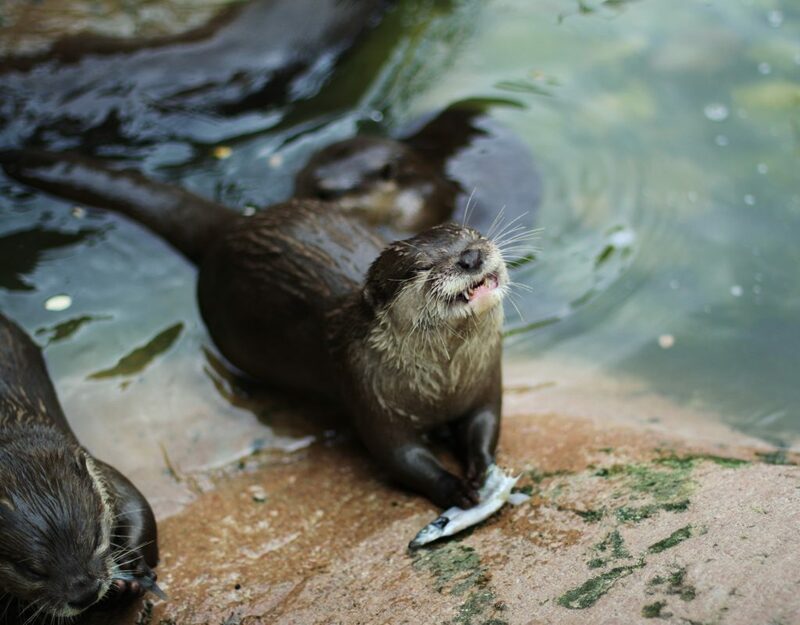 What Papa Otter does is he will put a rock in his mouth and will look at our guests pathetically and do a loud squeak! Guests are constantly coming up to me because they are concerned about Papa Otter, but he is not in any harm. He just likes the attention. We will even toss him a treat to confirm that the pebble is not stuck in his mouth. I think he even uses the pebbles to get his treats now! 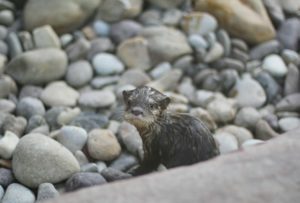 Are otters born knowing how to swim? No. Their mom and dad are very actively involved in the rearing of the pup, which is what you call an otter baby. Both mom and dad teach the pup how to swim. The mom will just throw the pup out into the deep end and watch it try to figure out how to swim. If the baby cannot figure it out, then the mom will pull it out. Similar to a bird teaching fledglings how to fly. Asian Small Clawed otters actually spend more time on land than in the water! They are river otters, which means when they are in the water it is usually just to hunt for their food. When they are ready for bed they just find a place to sleep on land. But, when they are in the water they can hold their breath for up to eight minutes! They can stay in the water so long by slowing their heart rate down and using less oxygen. So, they cannot actually breathe under water. 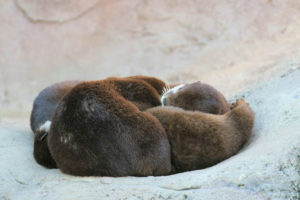 Be sure to come out and visit our Otter family!